This month's challenge for the St Luke's Charity Card challenge is "Come fly with me" and I hadn't got around to thinking about it until I saw the theme over at The Crafty Cardmakers Spotlight challenge. My crafty friend Jacki is hosting this one and was looking for support. The theme is parchment, which is not a technique I have ever attempted, but I thought what the heck and decided to combine the two challenges by using butterflies and a dragonfly on parchment. I drew the images and embossed them on a foam mat and coloured the back with promarkers. I attached the parchment to a torn piece of blue handmade paper with a jewelled brad. The base card I covered with some backing paper (candy from Jacki) that matched and used the offcuts to create a border and then mounted the topper with foam pads. Check out the St Luke's Charity card site as it's a very worthwhile cause and support Jacki's challenge, as there are loads of you out there who are brilliant at parchment craft! You've done a great job with the parchment - I'm hopeless with the stuff! I love the colouring on the back of it on the dragonfly to match the backing papers - inspired! Thanks so much for coming flying with us at St Luke's Charity Cards Challenge. Your parchment work is lovely and the card is beautiful!!! A fabulous creation especially if it's your first go at parchment craft. 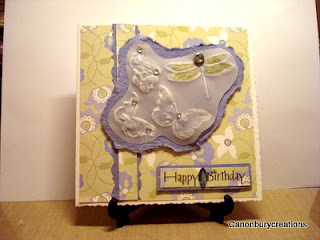 Val such a pretty card, your embossed butterflies are so pretty. Thank you for supporting us over at St Lukes....look forward to seeing you next month? Your parchment work is lovely. Landed here from the spotlight challenge set by Jacki. Butterflies and bling - well put together, congratulations on trying parchment work, also visited you through Jacki's challenge. This is wonderful!! Parchment art is something I love to see, but don't have the patience to do! Your butterflies are just super. Thanks for joining us with St Luke's Charity Card Challenge. Hope to see you again next month! Beautiful card. I love parchment but like Deborah haven`t the patience to try it myself. Thanks for joining us at St Lukes Charity Card Challenge. Sorry I so late commenting.